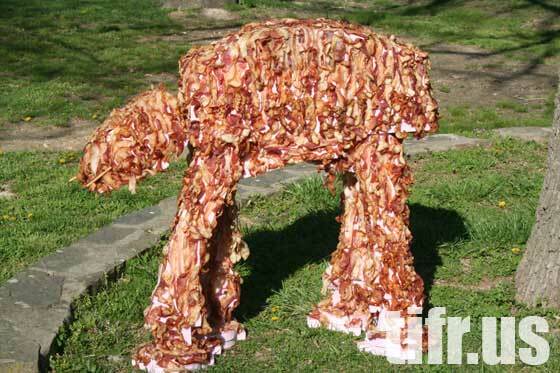 The Bacon AT-AT stands 3 ft tall and is made with over 40 lbs of bacon. The body was made from foam, then the bacon was attached. This beast took 21 non-stop hours to build. If you’ve ever once thought to cook 40 lbs of bacon in your kitchen in one sitting, I can now personally advise against it. Those of you hoping Lucas might finally get around to making that live-action, prime-time, Jedi-focused Star Wars series he’s been promising for the past fives years are yet again completely out of luck. Instead Lucasfilm announced today that they’re doing yet another Star Wars animated series, only this time it’ll be a comedy. Star Wars comedy may seem kind of lame but it’s the guys from Robot Chicken, Seth Green and Matthew Senreich, who are making it. Robot Chicken has already done more than its fair share of mining comedy from the Star Wars universe, putting these guys in charge is a stroke of genius. Also involved is The Daily Show’s Brendan Hay, and the series will be produced by Daytime Emmy and Gemini Award-winner Jennifer Hill while being directed by Emmy-nominated Todd Grimes. There’s a documentary floating around the festival circuit right now called The People vs. George Lucas which attempts to bring closure to the Star Wars issue which has plagued us all since Lucas ruined A New Hope by revising it to have Greedo shoot first. People vs. George makes a valiant attempt at wrapping it all up, but never quite gets there, in part because it can’t find the nerve necessary to truly take a stand. Enter RedLetterMedia, a company which has been releasing a series of extremely bizarre yet brilliantly perfect, in-depth reviews of the Star Wars prequels. A few months ago they did The Phantom Menace but now they’ve topped themselves by taking on Attack of the Clones. Yet the nine videos you’ll see included in this post are more than just an in-depth and occasionally creepy analysis of one failed Star Wars prequel. Amidst all of that they manage to sum up everything that was great and beautiful about Star Wars, while mourning the way one man has ruined it. It makes no excuses, it lays things out as they really are. The last video in particular, if you’re a fan of Star Wars or just a fan of great movies, will bring a tear to your eye. It’s worth watching all 90-minutes. Use the force, push play, and find the closure Star Wars fans need. It’s finally happened. NASA has discovered evidence that the Empire is preparing to move against the Rebel Alliance. They’ve spotted the Death Star in orbit around Saturn. 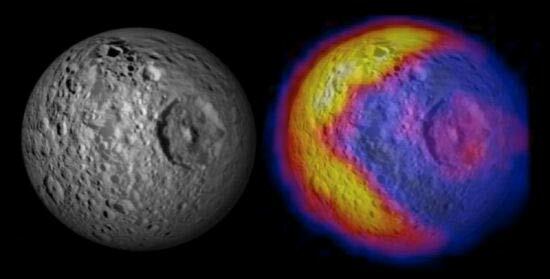 The following image, recently released by NASA, is a real photo of Mimas, long thought to be one of Saturn’s moons but now revealed to be a space station of awesome destructive power. Admiral Ackbar Is Ole Miss University’s New Mascot: Is It A Trap? This is not a joke. The students of the of Mississippi University have voted in Admiral Ackbar as the school’s new, official mascot. AllVoices says the university, looking for a new symbol which would launch them into the new millenium, put the choosing of their new mascot to a student body vote. The Star Wars nerd infested student body voted for Admiral Ackbar, Supreme Commander of the Rebel Alliance Fleet as their man. There’s only one hangup here. The university’s Mascot Committee stands between Ackbar and collegiate immortality. It’s possible that they could overrule the vote, though we hope not. If they let their Ackbar flag fly, Ole Miss is suddenly the world’s most beloved geek university. It may however, not be the best place to go if you’re hoping to meet girls. Putting Ackbar in this position of responsibility makes sense. He’s smart, confident, a product of diverse ethnic origins, and he can breathe underwater. He’s a leader of men, in a position of supreme authority, and he’s not the kind of guy you can lure into a trap. He’s the perfect mascot really. Make it happen Ole Miss!